So you just got your unemployment check and have a bit of free time? Let’s go to the movies then. What do you want to see? Beats me, too. Let’s check what’s out. Movie Phone: Fandango’s iPhone app shows you a film’s running time, who’s starring in it, and where it’s playing near you. No, of course I don’t have today’s paper. Don’t make me laugh. I’ve got my iPhone, though. I’ve got a couple of movie apps on it. Just downloaded Fandango the other day, as a matter of fact. I used Fandango all the time when my wife and I would go to the movies almost every Friday night. Of course, that was before we had kids. Good Web site, decent service. The Fandango app for the iPhone and iPod touch is pretty solid, too. It’s functional and convenient. I wish it had a few more features, but the app carries out its raison d’être with aplomb. 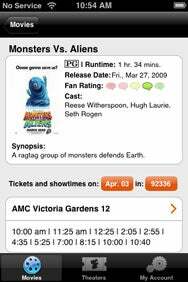 A movie ticket app really only needs to do two things seamlessly and well: It must let you search for movies near your location; more important, the app must let you buy the tickets with minimum effort. Most movie apps do a good job with the former by taking advantage of the handheld’s GPS locator function, but trip over the latter. Fandango does both very well. When you launch the Fandango app, you’ll see a list of movies currently playing in theaters. When you find a movie that interests you, tap the listing and a window will pop up with information about stars, running time, and where the film is playing near you. Most movies will have a trailer that you can watch by tapping the movie’s poster. You can also tap the Theaters button at the bottom of the screen to browse all the features playing at your nearby multiplex. You can save your favorite theaters, which is a nice addition for creatures of habit. The app will show that day’s movie times, but you can also look up times days in advance. The difference between Fandango and, say, Flixster’s Movies app ( ) is that you can enter and save your credit card information in the app itself. Once you’ve done that, buying tickets is a mere matter of a few taps. I was generally kind to Flixster’s Movies when I reviewed it in October, but I detested the way the app walked you through buying tickets. You ended up in Safari at Movietickets.com, trying to navigate several fields. It’s an enormous pain. Fandango’s solution is much simpler and more convenient. There are a couple of clear trade-offs with Fandango’s approach, however. First, if you save your credit card information in the app and you happen to lose your phone, somebody could enjoy a night at the movies at your expense. (But that’s all—the full credit card number does not display.) Second, Fandango will only let you buy tickets from Regal Entertainment Group theaters and that’s about all. Fandango will show you movie times for other chains, but you won’t be able to purchase tickets. That might be a deal-breaker for some moviegoers. Fandango doesn’t have the frills and features of some other movie apps. The app doesn’t link to news and reviews, show fan ratings or list this week’s box office take. (Fandango’s Web site does.) You can watch trailers for some current and future releases, but the app only lists attractions coming to theaters in the next week or two. Flixster’s app, on the other hand, has trailers for movies months in advance and has a robust DVD section, too. The bottom line: Lacking the news features of Fandango.com and putting limits on the theaters from which you can buy tickets hampers Fandango’s convenience and ease of use. Here’s hoping any sequel to this iPhone app turns out to be better. Fandango is compatible with any iPhone or iPod touch running the iPhone 2.2 software update.